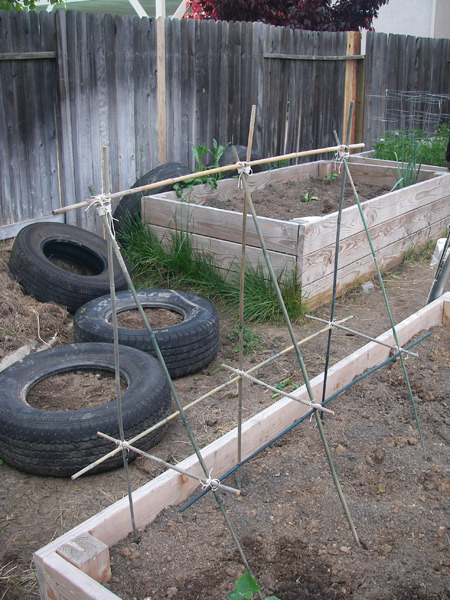 Building a basic a-frame for growing vine vegetables on is pretty easy, and very very cheap! The ones I build aren’t too large or very impressive, but it’s hard to beat the price, they work well, and they’re reusable. I’ve used this one for two years in a row so far. First go out and buy some string (butcher’s string works well) and some of those 4-ft long bamboo poles. You can get them from the hardware store. For this project, you’ll need eleven of them. 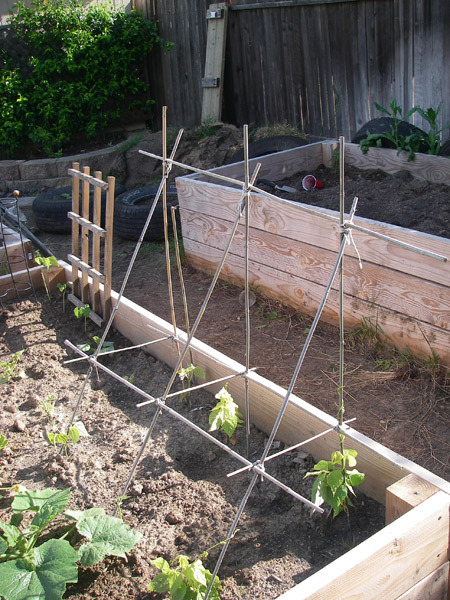 So you can make two a-frames per pack! 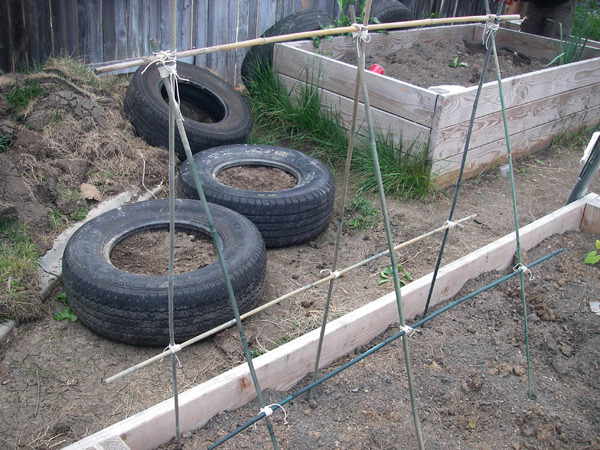 Not bad… Take two of your bamboo stakes and a piece of string 12″-18″ long. Make three of these. Place them next to each other in your garden, about 1.5′ apart. You should have used six stakes. Take the seventh stake and place it on top – use this to line up your stakes properly. Tie it on. 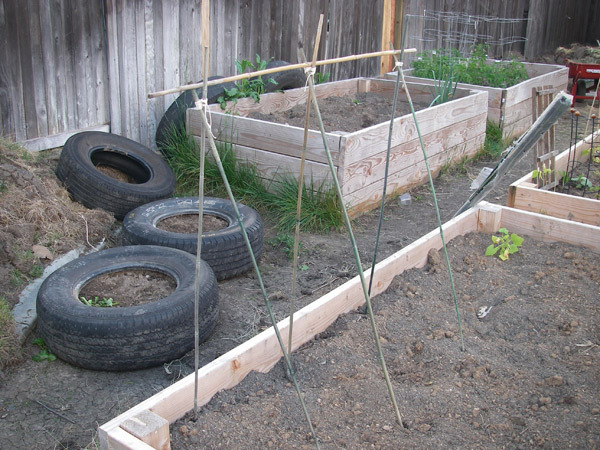 Now take your eighth and ninth stakes, and tie them going across, about 1.5′-2′ up from the ground. The stake getting tied to the vertical supports goes on the inside of the frame, the stake getting tied to the diagonal supports goes on the outside of the frame. Tie them to all three vertical supports, and all three diagonal supports. Now take your final two stakes and break them in half. You’ll only use three of the halves for this frame, but save the other one in case you want to make another frame later. 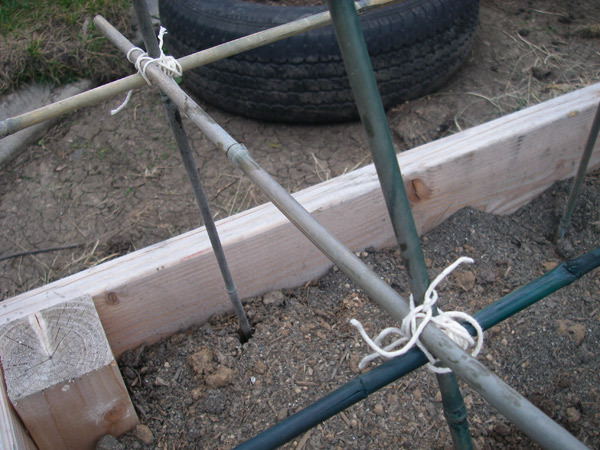 Tie them going across your horizontal supports, at each intersection. Once you’ve tied all three, your frame should be finished! Simple, effective, easy, and cheap. We grow a variety of vegetables on ours – cucumbers, beans, green beans, peas…they hold up remarkably well. One of ours began to lean a bit under the weight of all of our cucumbers, but it never fell apart and it never fell over. 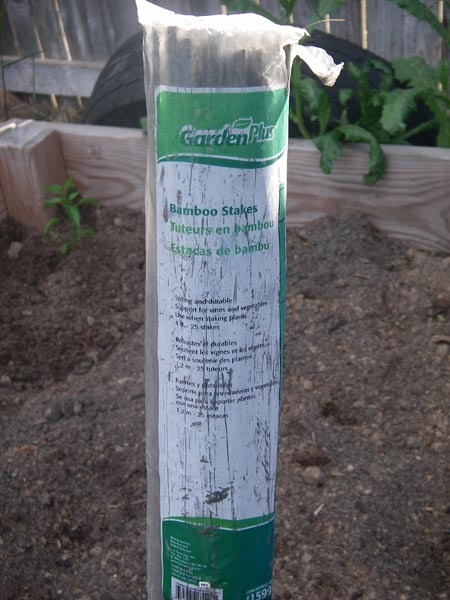 We plant one seedling at each base of the stake – so it should hold six plants. Great work! I wish I have space like you to grow more tomatoes, cucumber, and such. My tomato plants are still growing like crazy….not much tomatoes, mostly vine though. I will build a frame like yours next year. Thanks for the easy to follow instructions. Hey mooooom! <3!! I will help you build those frames if you want! 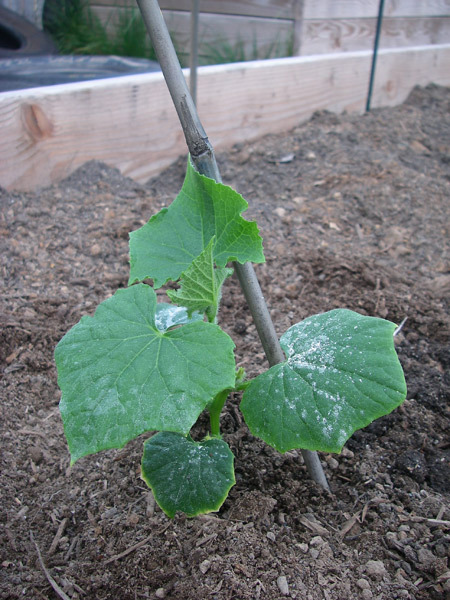 The cucumbers take up very little space if you get them going vertically.